← Serendipity, Luck or Opportunity? I’m loving my new planner. Not only does it keep me on track, the system is designed to allow for the addition of pages, notes, and reminders – a truly customizable set up. If I feel overly creative, there is also room to “scrapbook” on the calendar pages. I won’t be taking the scrapbooking to extremes in mine, but I have added a few stickers here and there just as reminders of important dates coming up, and I have added extra pages, a plastic cover, and a pocket at the back. It may sound old school but I like having the paper planner on the desk so I can glance over and refer to it anytime. I get a sense of calm knowing what is lying ahead and I like to be able to flip back and forth from week to week or month to month, seeing the current date and one in the future at the same time. This week my schedule has lots of work in it. First I have editing to do. I received my manuscript back from the editor on the weekend and now I have the task of fixing all the red ink. I will pick away at this all week. It may take a couple of days it may take the entire week, depending on how my creativity is flowing. Next on the list is to continue self-editing the next manuscript. I worked on it over the holidays and it is starting to shape up. It still needs lots more work and will keep me busy until it is due to ship out to the editor in two weeks time. Third on the list is to look at a story I wrote a couple of years ago. I worked on it over the holidays as well and it is a far different story than the original. Still the same overall story arc but the manuscript has changed dramatically with all the things I’ve learned since I originally wrote it. I like it even more now. It needs some more fine tuning before it heads off to the editor next month but I am feeling confident. Goes to prove you can teach and old dog new tricks. To some this type of scheduling may sound crazy but I like to work on multiple projects at the same time. When I run into problems on one I go to the next. That breaks the day up and I can go back to the original with renewed creativity. 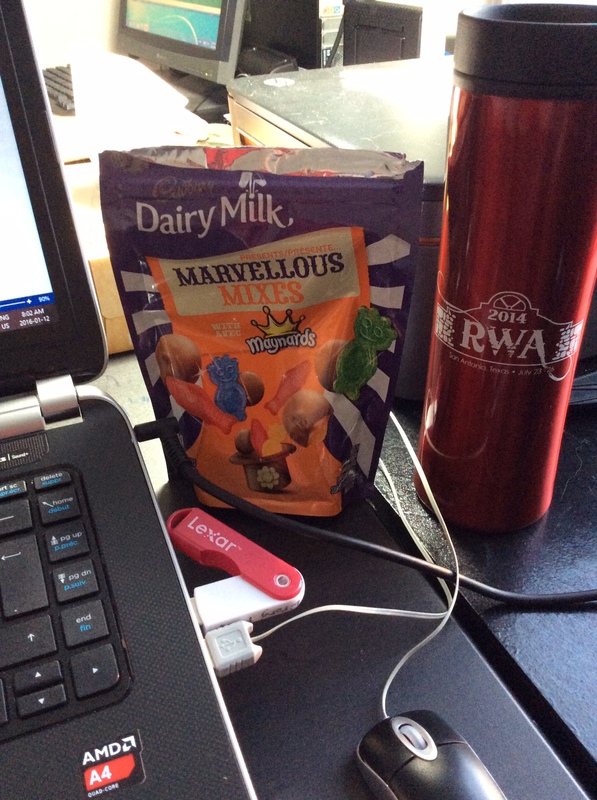 And of course, if I get really stuck, I have my supplies right at hand to cheer me on – coffee, chocolate and gummies, you can’t go wrong with those.